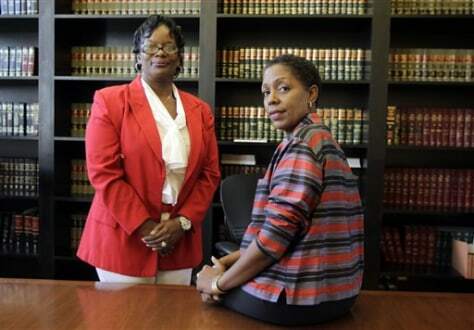 Attorney Denise LaRue, right, and her client Brenda Chaney pose in her law office in Indianapolis. Chaney worked in a Plainfield, Ind., nursing home that issued her an assignment sheet including a daily reminder that one woman in her unit "Prefers No Black CNAs." Nursing home residents have the right to choose who's going to take care of them, except when those choices are based on color, 7th U.S. Circuit Court of Appeals ruled in Chaney's case in July.